Last summer, a respected policy expert from the Brookings Institution spoke at a large meeting. He introduced himself, saying that he works with a lot of brilliant economists who can’t understand why the recovery is so slow. Whoa! There’s a shocker. Corporate profits are at historic highs, and workers are not sharing gains. Economists have an inside joke that says a great deal about our problem: “The winners could compensate the losers.” Of course, the whole point of winning is to win! Winners are perfectly content to keep everything, and share nothing with workers, families and communities. Our slow recovery is the result of policy choices we have made as a country. For a generation after World War II, prosperity was shared broadly. 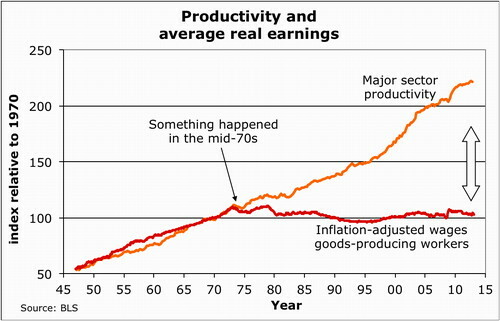 In the mid-70s, wages abruptly de-coupled from gains in productivity (Figure 1). If workers had continued to share in gains from productivity for the last 40 years, then wages would be at least twice what they are now, adjusted for inflation. Figure 1. If wages had stayed coupled to productivity, worker income would be double what it is, now. 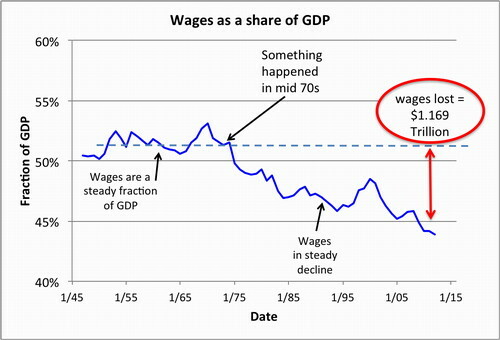 In the mid-70s, wages began to decline as a share of total economic activity (Figure 2). If wages had followed the post-war trend, households would have a trillion dollars more to spend on health care and education. Most of any new income is already going to fabulously rich winners. (See Figure 4). Figure 2. Wages are shrinking relative to GDP. ‘Figure 3. 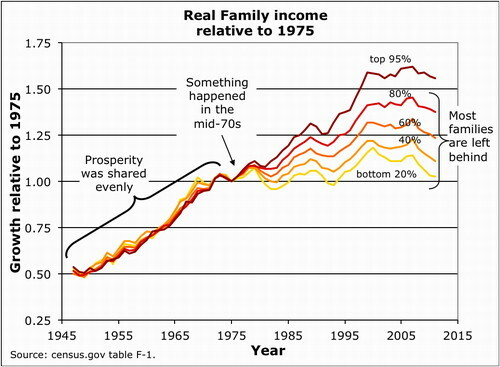 From World War II until the mid-70s’ households shared gains. Figure 4. 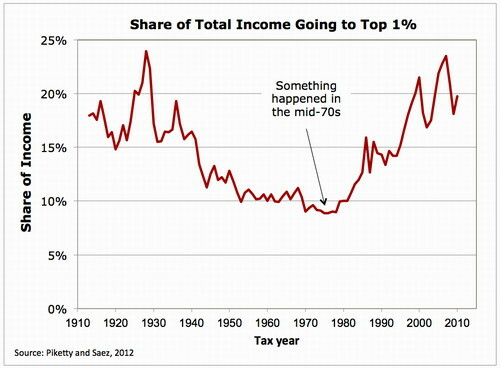 Since the mid-70s, the top 1% have taken an increasing share of gains. In the post-war period, our business values balanced the interests of investors, workers and communities. In the mid-70s our business values shifted. We put shareholder interests first. Greed was good. Policies since then have reduced bargaining power for workers, while increasing economic leverage for the top 1%. We have been very intent on “making business succeed,” and less intent on sharing gains with workers, families and communities. Our policy expert from the Brookings Institution needs to consider questions like these. How do we share gains from productivity? How do we share gains from trade? Think about the thousands of labor-market transactions that happen every day. Multinational employers steadily move work offshore, and lay off thousands of workers. We’ve cut funding for education; student debt is over a trillion dollars. We’ve terminated pensions, weakened unions, made work more contingent and more precarious. Wal-Mart cuts hours to avoid paying for health care. Some elected officials demonize teachers, and public employees, and turn public opinion against any regular worker daring to hope for a higher standard of living. Globally, workplace insecurity and inequality are at historic levels. This isn’t fair. More important; it doesn’t work. Seriously, will we all do better, when we all do worse? This long-term decline in bargaining power for workers and communities leads us to a shabbier Lesser America. What works? Workers are also consumers. My well-being is directly connected to the prosperity of my neighbors and co-workers. If I’m a worker or an employer, I will do better when I have prosperous customers who can buy what I make. We will all do better, when we all do better. An earnest economist once told me that the purpose of an economy is to raise our standard of living. The look in her eyes also said that an economy that enriched 1% at the expense of the other 99% would lose legitimacy and risk political instability. This is more about politics than economics. Given enough time and beer, discussions of this nature inevitably come around to the corrosive effect of money on politics. It costs more than $1 billion to run for President. I don’t have $1 billion, but hundreds of politically active winners in our country do. A Supreme Court decision known as Citizens United magnified the unhealthy power relationships that pump trillions of dollars away from most of us, to the small number of winners. Stiglitz, an economist at the top of his profession, emphasizes the “winner-take-all politics” of inequality. We now have a generation of experience with trickle-down economics and free trade policies. These profoundly bad policies diminish democracy, and divide our nation, granting rights and powers to a small number of winners, while weakening civil society and reducing the bargaining power of workers around the world. Gains are shared through political and social power. Since the 70’s and 80’s, investors, banks, CEOs and other winners have been very successful in their struggle to put their interests first. I’m impressed. They will keep gains, until the rest of us find political and social power to change the way gains are shared. The labor movement struggled as a social and political movement through the 1930’s, until workers united to claim their share of gains from their work. The civil rights and peace movements struggled in the 50s, 60’s and 70’s before building political power to achieve public policy goals and share gains. Women and environmentalists struggled as social movements from the 70s and 80s before their communities produced gains and protections. First, we need to change the way we look at each other. We are neighbors and co-workers, not moochers or takers or parasites. All work has dignity. Workers deserve a fair share of gains we produce and communities should enjoy rising standards of living. These are traditional values. They worked. We can rehabilitate a Social Contract that connects us. With a restored self-image, we can reverse Citizens United, rebalance our political process, and find trade policies that serve society as a whole. Stan Sorscher is Labor Representative at the Society for Professional Engineering Employees in Aerospace (SPEEA), a union representing over 24,000 scientists, engineers, technical and professional employees in the aerospace industry. He has been with SPEEA since 2000. I agree with almost everything here. Global governance without global government, the need to restore social power to the rest of us; and so on. Well said. But you might clarify one language issue and one power issue.